Mestizo Arts showcases art inspired by refugees from Burmese genocide. Art is capable of a lot of things—including fulfilling a role of visual storytelling, of cultural expression, and serving as vehicle for political awareness. Mestizo Coffeehouse & Art Gallery, a multicultural touchstone in Salt Lake City, is exhibiting On the Border: A Story of Forced Migration from Burma, which features the watercolors of Maung Maung Tinn, a Burmese artist living near the border of Burma and Thailand, whose works depict the struggles of refugees fleeing torture and genocide by the Burmese military regime. “Karen people are one of the eight indigenous groups in Burma being tortured and killed by the Burmese military regime,” notes Ler Wah of the Karen Community of Utah. As a result of the genocide, Karen fled to Thailand and settled in refugee camps along the Thai-Burma border. Many have lived there for 20 years or more, disconnected from the outside world for all those years; resources such as food, health care, education, employment and media have been limited. “Some of them resettled to [the] United States to start their new lives, but still, there are barriers such as language, transportation, access to public resources and familiarity with technological devices, such as phones,” Wah says. Tinn has a very interesting attitude about the uses of art: “Media is very important to show situations to people. 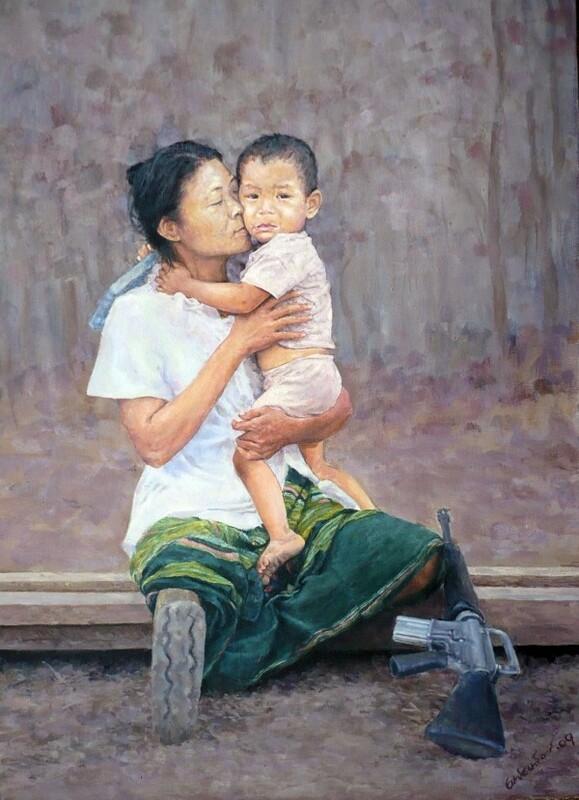 Art is one part of [the] media.” Oftentimes he paints from photographs, such as the poignant image of a mother holding a child, a rifle at her knee for protection (pictured). The condition of life as a refugee is all too common across the globe, explains Rosemarie Hunter, special assistant to the president for Campus Community Partnerships at the University of Utah and director of University Neighborhood Partners, which helped coordinate the exhibit, along with the local Karen community and University of Utah faculty and students. The exhibit is a fundraiser for the refugees living on the border and the local Karen community, and for a member of the Karen community to travel with a university group doing humanitarian/education work at the border. The opening included a Karen weaving demonstration and sale. Donations can be made to University Neighborhood Partners (1060 S. 900 West, Salt Lake City, 84104). To purchase weaving products, contact yda.smith@hsc.utah.edu.